Congratulations to Cole Cunningham, curator of the Modern Tulsa blog and website, and featured in Tulsa People magazine this month. The article is titled Endangered Tulsa, and lists the movers and shakers in Tulsa's architectural preservation community, including Rex Ball, LeAnne Ziegler and Herb Fritz. Cole's photo features him in front of one of my favorite endangered buildings- the futuristic branch bank complex. 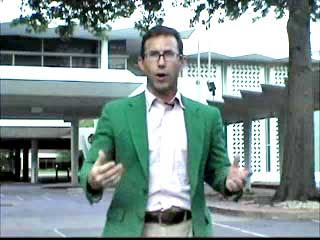 The Auto Bank provides the backdrop for this 2005 amateur video featuring Scott Smith.The mid-century marvel is often referred to as the Auto Bank, which makes sense as the drive-through lanes dominate the site (erroneously listed in the article as being located at Sixth and Cheyenne- it's actually Sixth and Cincinnati). But I recall it being called "branch bank" and "model bank" over the years. And indeed, it does seem like a suburban branch bank someone deposited in the downtown environ. Two huge tall doors open to the main lobby while the upper deck features a large parking area and a standalone office structure. I could see this being the prototype for the ideal suburban bank in the Atomic Age. hi rex, the stand alone office unit that is elevated across from the upper parking lot at the 6th and cincinatti autobank was actually a social/alumni meeting room for the adult supporters of central high school. it was named the "Tom Tom Room" and had a bar, some food service and outdoor patio. a very very unusual place and im glad it remains in downtown tulsa for, lets hope it finds an economical use and does not become a flat parking lot.